Yesterday I spent most of the day thrift store shopping with Sarah and Jessica. 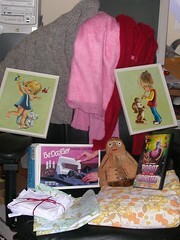 We hit the Salvation Army and 3 Goodwill stores and here is all of my loot. I spent under $30 and I came out with 3 sweaters to frog for the yarn, a pile of white hankies to embroider, a coconut monkey to add to my collection (first Lexington tiki score ever! ), 2 framed big-eyed kid prints, unused floral sheet that I will make into a skirt and some bags to sell, floral pillowcase that will become a skirt, a 50's sci-fi movie (my most expesive purchase at $4.50, but I am a sucker for technicolor), and some random socks for Philip to use for sock creatures. The score of the day, however, was the new-in-the-box Bedazzler I found for $1.99. This beautiful machine came with tons of studs and rhinestones that will be used for something fabulous, though I am not quite sure what that will be. Now I am off to the farmers' market for some yummy veggies.